Just a few years ago, the concept of Scudding left the traditional skiving method in the dust, so to speak, for internal gear production used primarily in the powertrain buildup. This process, 5-10 times faster than gear shaping, formed the surface of the workpiece through several, small enveloping cuts, providing a surface finish and part quality level that was far superior to hobbing, shaping or broaching. Scudding is a continuous generating process, meaning no idle strokes on the machine tool, as when shaping gears. Ring gears, sliding sleeves and annulus gearing, whether internal helical or spur, external helical or spur or blind spline, synchronizer parts with block tooth features and synchronizer hubs remain among the popular products in the market, made with Scudding technology. Impressive a technology as it is, the industry took another step forward recently with a new process known as Hard Scudding. The conventional Scudding process provides excellent results on green or soft gears, while this new advancement enables the re-machining of hardened gears with a tooth-to-tooth composite error and total composite error in the AGMA 12, DIN 5 range and a surface finish better than 1.5 Ra. The capital investment is minimal for shops and production departments already doing Scudding, because the same gear can be run on the same CNC machine, using a solid carbide tool to do the work. Recent testing done on various internal automotive powertrain and agricultural machinery ring gears is showing extremely positive results. Stock division calculations on the tooth position are standard technology for GMTA and Profilator, so re-cutting is quick and easy. Using the latest CNC technology to control the machine kinematics, users are able to transfer this technology to Scudding machinery that is already deployed in the field. Thus, the same part can be cut on different machines at different times, allowing for more flexibility in scheduling. 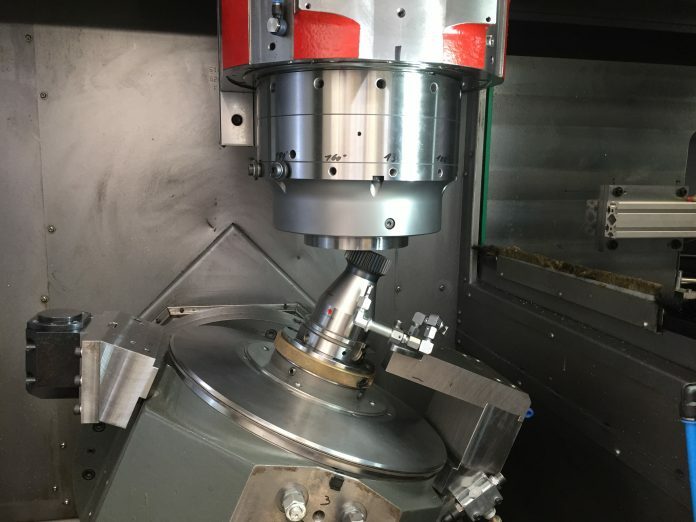 With today’s portable programming, onscreen or offline tool path and cutting condition simulation, plus the immediacy of call-up onscreen for all values and tolerances in real time, the busy machine shop or large production department stays flexible and demand responsive, using this Hard Scudding technology. In some cases, this new technology is applicable on near net, pre-hardened gear blanks, allowing significant step reductions in the manufacturing process. In operation, cutting 60-100 thousandths per flank on a tooth, the Hard Scudding process can be used on a carburized or through-hardened parts; nitriding generally does not provide enough case depth to ensure sufficient stock for “clean-up.” An automotive ring gear, for example, which requires 40-50 seconds for Scudding can be Hard Scudded in 25-30 seconds. This process development stands as a viable and very cost-effective alternative to conventional grind-and-hone operations, yielding a highly attractive cost per piece and extended tool life scenario. The added benefits of reduced capital outlay and a significantly more consistent end product bode well for the automotive powertrain and other gear market segments. Test data can be discussed on a case-by-case basis and I welcome any feedback on this column from the powertrain and gear cutting communities. Scott Knoy is the Vice President of Sales & Marketing for German Machine Tools of America (GMTA) in Ann Arbor, Michigan and brings 25 years experience in automotive gear cutting machine technology to his customers. He may be contacted at scott@gmtamerica.com or at 734-973-7800.